Chronic Renal Failure, or CRF, is sometimes called Chronic Renal Insufficiency, or CRI. It occurs when the kidneys can no longer concentrate urine effectively. It is a common problem as dogs get older and the kidneys start wearing out as part of the normal aging process. CRF/CRI is not an immediate death sentence, and dogs can live happy lives for years with it, depending on how it progresses. A good place to read about it is http://www.2ndchance.info/kidney.htm , an excellent site where many other veterinary topics are discussed. What I read there was heartening, because Gabby’s creatinine maxed out at 1.8 to 2.0, except for the two times she was sick. It always came down afterwards with medical treatment and good hydration. Your dog will be thirsty quite often, and it is essential that they be able to drink whenever they want, 24/7. I made sure there were bowls of water in every room and in her crate so Gabby could drink whenever she wanted. There was always a bowl of water on my nightstand, illuminated by a small LED lantern covered by a towel to soften the light, so she could drink in the middle of the night when she was in bed with me. I took her out often, and she would let me know when she needed to go, too. Later on I supplemented the water she drank with subcutaneous fluids. If your dog is showing signs of increased thirst and urination, be sure to take him or her to the vet ASAP for her urinalysis and bloodwork. Whatever you do, DO NOT withhold water from the dog. The dilute urine also increases the chances of a urinary tract infection (UTI) which can spread to the kidneys and cause serious problems, especially in females. Be sure to have urine tested immediately if you suspect a UTI, and do a culture after antibiotics clear the infection as they can be hard to clear. Your vet will know what to do. A complication of CFR is the increased production of urine. Your dog will be drink more because the kidneys need more water to effectively clear waste from the bloodstream. While the bloodwork will show good values, the urine is dilute and your dog may seem normal and happy other than increased thirst and urination. 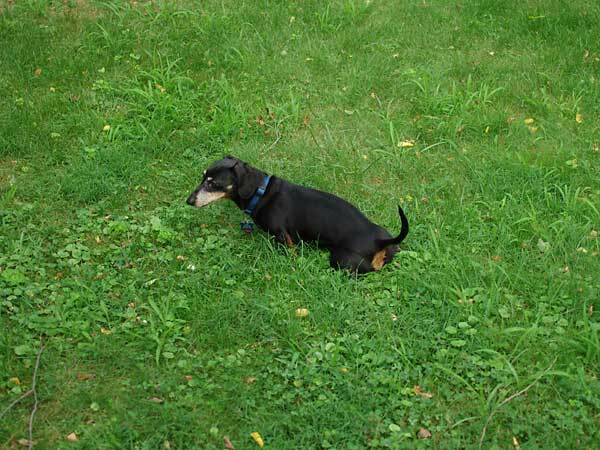 The increased urine production turns into incontinence because the sphincter muscle weakens with age, and combined with the pressure from the extra fluid your dog won’t be able to hold it. This is especially a problem with female dogs. The bladder will get bigger, too. Proin is a great option if your dog tolerates it well. It strengthens the sphincter so the urine can be retained. Your veterinarian will work with you to determine if it is appropriate for your dog. In Gabby’s case, the medication worked well but we later discovered that proin was a seizure trigger, so I kept her off it after that and came up with other solutions. Some of my solutions to the CRF and incontinence problem will be shown in later chapters. There is lots good information online about the subject, and I am not going to rehash it here. Just know that CRF/CRI and its symptoms can be dealt with, and I hope my experiences and solutions can be helpful to you.